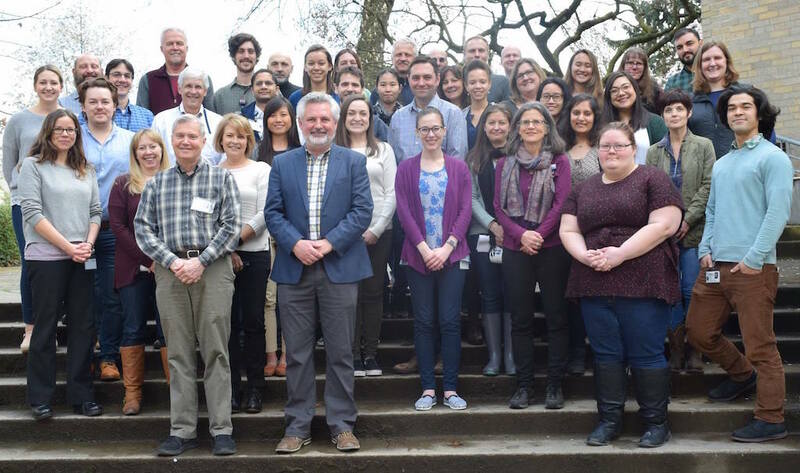 Researchers, practitioners, students, and members of the occupational health and safety field got together in Seattle last week at the Future of Occupational Health Symposium, hosted by the University of Washington and organized by the Department of Environmental & Occupational Health Sciences (DEOHS). 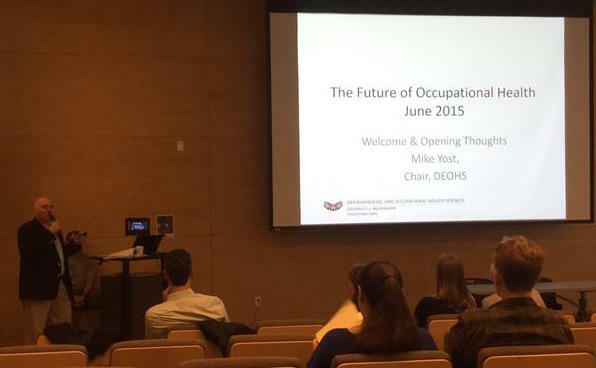 The Symposium was spurred by the changing occupational health landscape, which in a global economy, has moved toward a fragmented workforce consisting of more temporary, contract, immigrant, and vulnerable workers. Adding to the risk factors are dwindling unionization, which has long been a symbol of worker empowerment, global climate change, which exposes workers to greater health and safety risks, and blurring boundaries between work and non-work related effects on worker well-being. 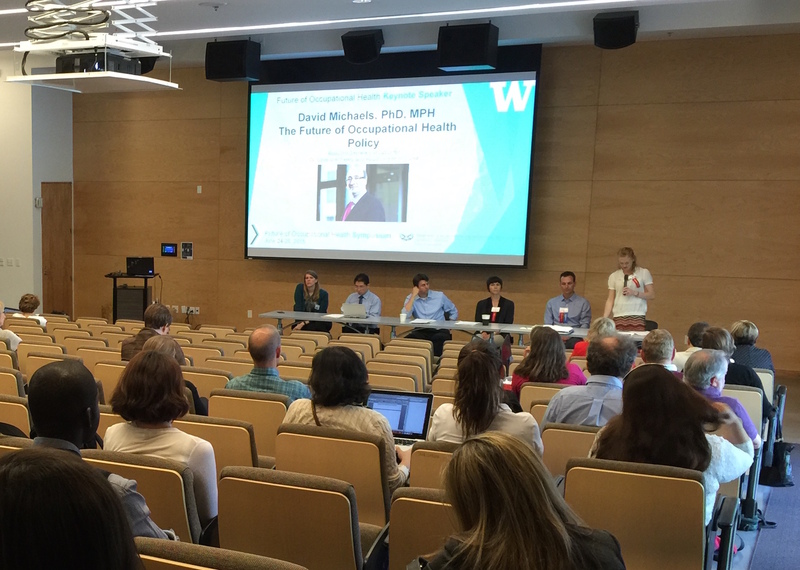 Intended to kick-start a continued effort, the aim of this gathering, as introduced by Dr. Mike Yost (UW DEOHS), was to explore current challenges in the field of occupational health with regard to the changing workforce, suggest alternative models, and recommend actionable goals for improvement. Dr. Linda Rae Murray’s (Cook County Dept. of Public Health, Illinois) impassioned keynote urged everyone in Occupational Health to understand the history of this field and to be mindful of its fundamental purpose and ideology: human rights, justice, and protecting the power of the worker. Through a series of classic paintings, Dr. John Volkens (Colorado State University) creatively told the story of Occupational Health in the 21st century in regard to hazardous occupational exposure. Referring to limited resources in this area, he discussed the need to redirect our study focus to “what we need (rather than) what we want”. Switching gears toward contemporary communication strategies in Occupational Health, Scott Macklin (UW Communications Leadership) demonstrated the importance of utilizing multimedia effectively. High quality videos, engaging web experiences, and immersive storytelling, i.e., “making stories with (occupational) communities instead of about them” are elements of communication we cannot ignore today. At dinner, Dr. Gerald Markowitz (CUNY, New York) revisited the history of Occupational Health as it relates to changing trends in today’s context and talked about the transition from the “struggle between safety and profits” to ensuring a safe and healthy worker. 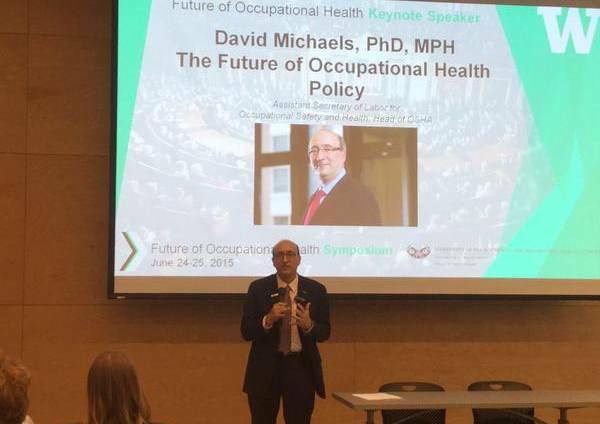 Among many key points, Dr. David Michaels (OSHA) considered the changing role of OSHA since its inception in 1971 and highlighted the organization’s challenges at a time of when “workers are (becoming) invisible”. 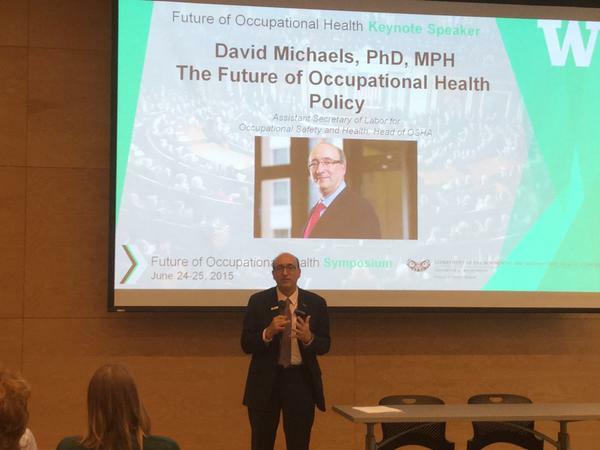 Dr. Michaels emphasized safer environments, meaningful work, equitable worker compensation, partnership with community groups, and importantly, worker rights as crucial considerations for positive change. He encouraged states to work toward establishing organizational “duty of care”, a legal step that would enforce accountability and burden of responsibility in ensuring worker health and safety. It wasn’t long before consistent themes for improvement emerged in this highly interactive Symposium marked by moderated group discussions and heavy audience participation. In addition to greater interdisciplinary collaboration, it was proposed that we need to graduate from an “occupational health” to a “worker health” perspective as a more holistic approach to achieving worker well-being. Many saw value in mobilizing community and advocacy groups to help educate and empower workers at a grass-roots level. Lastly, the possibility of integrating worker compensation and well-being with the recently upheld Affordable care Act was explored, as was “duty of care”. In his closing comments, Dr. Howard Frumkin (UW School of Public Health) summarized themes at the Symposium as he made the case for the underserved worker in the United States. In redefining the field and future of Occupational Health, Dr. Frumkin advised stakeholders to work toward goals that are relevant in the larger community, while keeping in mind that Occupational Health is really a “global health phenomenon”.